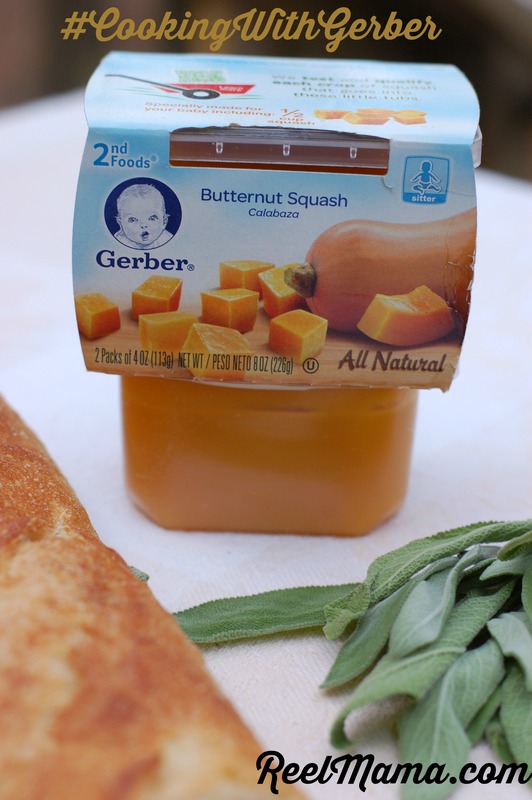 Disclosure: This butternut squash soup recipe post exploring #CookingWithGerber is in partnership with The Women Bloggers and Kendal King Group on behalf of our client. Have you ever cooked with butternut squash? Chances are, if you’ve seen it in the supermarket, you might have been mystified. Cast aside in the “strange food,” or “food that is too much trouble” category, the noble butternut squash is often overlooked. It’s not easy to cook. It’s a tough gourd to crack, and it’s a bit of a pain to dissect. However, your palette need not be deprived of the butternut squash’s explosion of flavors again. I discovered a secret shortcut. I’ve been #CookingwithGerber. The baby food? Yes! 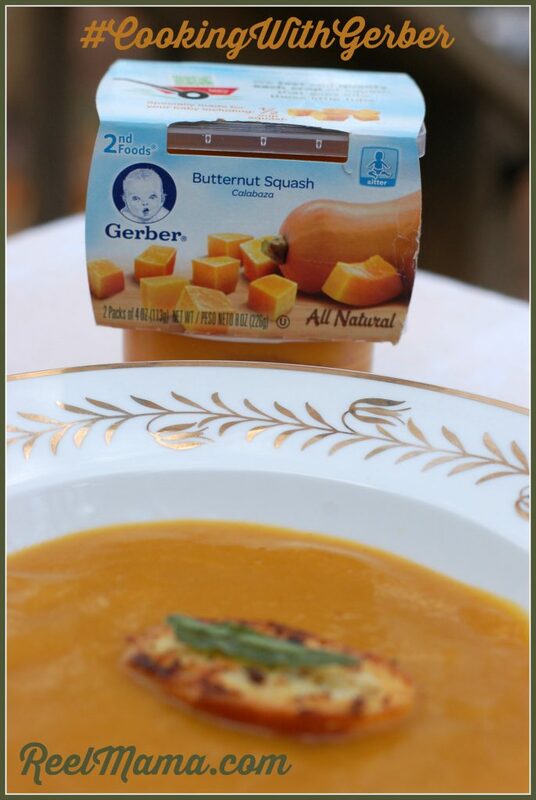 #CookingWithGerber has led me down a very fun path of experimenting with new recipes, and getting creative I found one that I even might serve at my next dinner party: butternut squash soup! If you are skeptical about my approach, I understand. I know I was unsure at first. How could baby food be used in something adults would want to eat? Let me be the one to soothe your doubts. I used the Gerber Butternut Squash flavored baby food for my butternut squash soup recipe, and it turned out so well, I ended up going back to buy lots more at Walmart! You’ll need: Fresh sage, olive oil, favorite Italian seasonings. Heat a tablespoon of olive oil in a pan. Cook the sage on one side for 5 seconds, pressing flat in the olive oil, then flip and heat for 5 seconds on the other side. Sage should be bright green when done. Season to taste. Using the same pan where you cooked the sage, add another tablespoon of olive oil, heating the pan over a medium flame. Toss in thin baguette slices and stir and turn over periodically with a wooden spoon. Add your favorite Italian seasonings and fresh sage pieces. I like to use the seasonings from an Italian dressing seasoning packet to add a savory burst of flavor. Once the baguette slices are crispy, you are done! These make great croutons for salads too. Do you have #CookingWithGerber inspirations? Share them in the comments section! This sounds soo good! And I love you were so thrilled and amazed you went back and bought more ingredients. When my neighbors see baby food in my groceries, they are going to start wondering!!! I’d love to try this! This would definitely be not to complex and delicious enough. Thanks for the great idea. I am getting over a bad cold and I so need to have a bowl of this thanks for sharing this one. Sign up for Reel Mama’s email newsletter! I’m so delighted to welcome you to ReelMama.com, your resource for fun and memorable family together time, featuring movie reviews and family films, creative parenting, DIY, recipes, giveaways, and much more. Make yourself at home and have a look around. If you find a post you like, leave a comment. I’d love to hear from you! I welcome emails at Lauren at Laurenivychiong.com. Grab the Reel Mama button!